Ahead of judging the Queen of Style event at Stobo Castle Ladies Day at Musselburgh Racecourse, Zack and I took a quick visit to Stobo Castle for the evening to fit in some relaxation in our busy lives. Nestled among the beautiful Scottish Borders countryside, Stobo Castle offers friendly service, great food, and stunning spa facilities. A destination spa you can truly unwind in. There’s something magical about a Scottish Castle. Perched on a hill amongst rolling grounds, shaded by trees and set around a picturesque loch, Stobo Castle effortlessly sets the scene for an experience less ordinary. Restoring a sense of balance with nature while escaping the city. Breathing fresh country air looking on to a sea of greenery definitely brings an element of serenity. 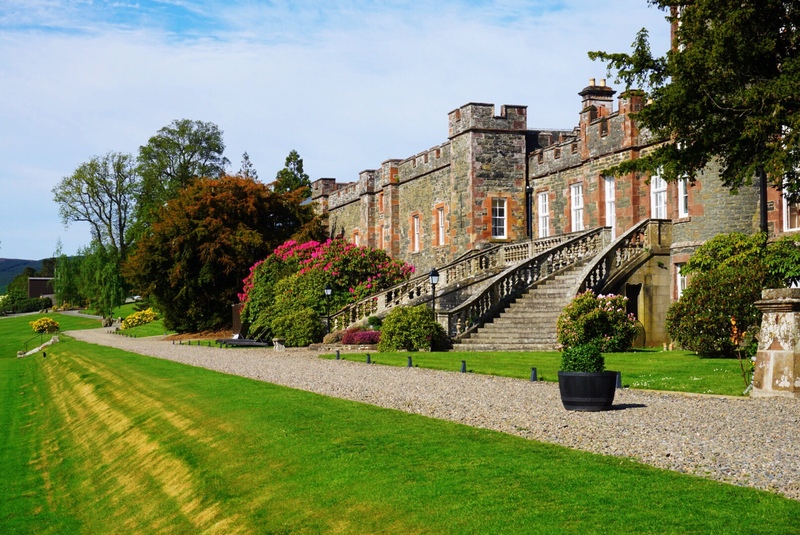 You can explore the grounds at Stobo Castle with country walks featuring a loch, Japanese Gardens and tennis courts. Stobo Castle offers a range of accommodation options, from lodges to single rooms. We stayed in the very funky classic room ‘Graham’, with beautiful views of the countryside. Featuring two double beds, gowns, slippers, bottled water and luxury Molton Brown toiletries. My pyjamas unintentionally matched the decor – I may try to do this at each hotel we visit from now on! During our stay we unfortunately did not get to experience any therapist treatments, there is an extensive list available featuring Caudalie, Neom and Darphin (see full list here). We did however make use of the spa facilities and managed to fit in a quick 15 minute water-bed massage, great if you want a quick fix! The dedicated Relaxation Suite is a serene environment in which to simply chill out and be calm or to rest following a treatment, the decor is stunning. Stobo has one of the most advanced hydrospas of its kind. Airloungers are designed to give an air massage along the full length of the body, supplying millions of bubbles to give an invigorating massage. Two giant water fountains deliver a deep neck and shoulder massage (Zack’s favourite!). The three outdoor hot tubs provide seating for guests to enjoy a soothing water jet massage whilst feeling at one with nature. We loved chilling out in the hot tub area, open till 10pm. Stobo Castle’s 25m swimming pool features spectacular views across the Scottish countryside, with poolside loungers taking prime position of the panoramic views. Dining is easy breezy at Stobo Castle. Meals are included for residents of the hotel and they can be as formal or informal as you like, you will be made to feel comfortable either way. I loved our stay at Stobo and will definitely be looking to make a return visit in the future.